Sharp-looking Tag Heuer Formula 1 Chronograph CAH1012.FT6026. Formula 1 watches are made with a passion for racing, so they take pride in their smooth, precise movement and 1/10 second resolution chronograph. It also has a tachymeter, which is handy if you want to know how fast an object is moving. If you do not know how to use a tachymeter, there are videos on YouTube that will teach you how, or refer to the user manuel. The anti-reflective sapphire crystal is a must in any high-end watch and will protect the dial from bumps and scrapes. I think the deployment buckle is perfect for this watch, since it is a sporty timepiece, and traditional buckles are better for leather straps. 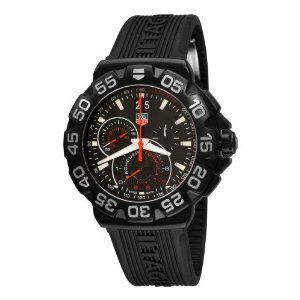 The Tag Heuer Formula 1 Chronograph CAH1012.FT6026 is priced at $1,800, but you can find it on Amazon for $1,425. At the time of this writing, there was only one left in stock. But I also found it for sale on other sites for as low as $1,290. It’s worth shopping around to find the best price. Although this watch is advertised to be classy enough for any occasion, I disagree. I think it is definitely versatile, but to a limit. Some fine occasions will call for gold or silver timepieces. Otherwise, this watch has a lot to offer. The bold, athletic quality, good looks, and fine precision workmanship of the Tag Heuer Formula 1 Chronograph CAH1012.FT6026 are sure to make it popular.